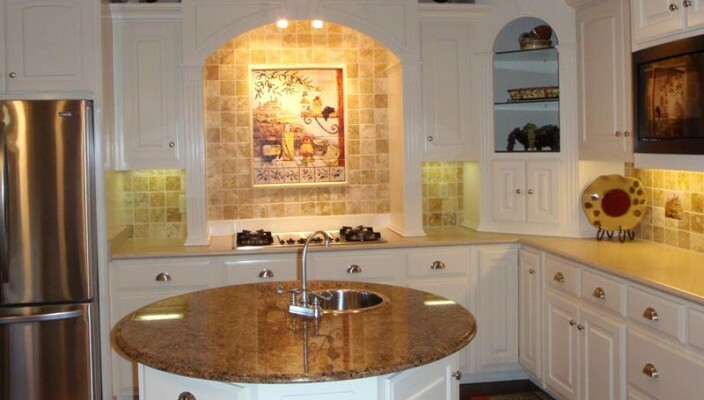 A kitchen is an important part of a house which is also a representation of the ones taste and proper hygiene. This beautiful kitchen offers you exactly with all the essentials that you must have in your kitchen. The awesome color combination is an eye soothing factor blended with contrasting colors of the marble slabs. The closed cabinet, the shelves and the paintings on the wall totally gives it a classic look. The wooden interior is very modern at the same time also very elegant. The wash basin is a masterpiece of its kind the side of which also serves as counter space and island. The twin roof lamp over the stove gives a fantabulous effect to the whole kitchen thus creating a soothing ambience all around. The mat with its beautiful color combination over the floor is in perfect contrast against the floor giving the ultimate touch to its beauty and class.